Thanks to C. Berg for this find. Turbines have been hailed as a clean, alternative fuel supply but the UK should not expect them to play a major part in how we try to solve climate change, claimed a leading scientist. In 2009, the UK Budget meant that the budget for wind power in the UK could amount to £525million between 2011 and the end of this year. In the latest debate hosted by the Daily Express, two experts maintain mankind is not doomed, despite some scientists pointing to melting ice caps, rising sea levels and erratic weather. But they debate the extent to which we are to blame for the current situation and question whether new kinds of energy are the solution. 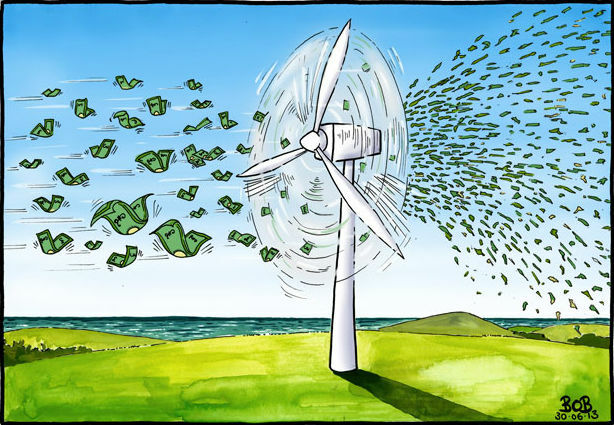 Dr Benny Peiser, Director of The Global Warming Policy Forum, said wind turbines have reached the limit of their effectiveness and money should be spent elsewhere. “I’m all in favour of alternative energy,” he insisted. “[But] I’m against picking winners and throwing money at technologies that might not have a future. “Wind energy I think has come to a limit to how efficient can get. Continue reading here….